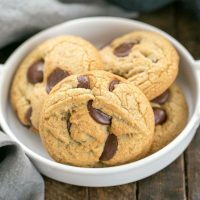 A caramel undertone from the brown butter makes these chocolate chip cookies something special! Melt 10 tablespoons of the butter in a saucepan over over low heat until melted. Increase heat to medium, cooking and stirring for a few more minutes until the butter is golden brown with a nutty fragrance. Pour into heatproof bowl, and add the remaining 4 tablespoons of butter. Stir until melted. Add both sugars, then vanilla. Mix in egg and egg yolk. Add baking soda, then flour and mix until just combined. Add chocolate and mix until well dispersed. Use a large cookie scoop to make dough balls. Place about 2 inches apart on parchment lined cookie sheets. Bake 10-14 minutes or till cookies are golden. Cool on rack. Adapted from Cook’s Illustrated’s Perfect Chocolate Chip Cookies.